Just got an email from Dreadbox. Now they are offering a Erebus DIY kit like they did with the Hades. Kind of interesting because originally they decided to stop offering the Hades kit because of the logistics of supporting that. Now they offer this. I built the Hades and in the process of making a little wooden case for it to replace the cardboard one it comes with. I would've loved to buy Erebus kit but I already have a Erebus. Kind of interesting because originally they decided to stop offering the Hades kit because of the logistics of supporting that. Now they offer this. The difference this time is they have firmly stated that you buy under the condition there is no support, which will free them from the hundreds of newbie f@ck ups. I ordered instantly, i'd love to see a NYX Eurorack but seems the reverb isn't their circuit it will probably never happen. i'd love to see a NYX Eurorack but seems the reverb isn't their circuit it will probably never happen. that's what i would like to see too, NYX Eurorack! is this what being influenced by ads feels like? It's not really clear from the front panel layout, but is this a semi-modular module? ie is the audio path pre-patched through the envelope, delay, lfo etc., or are the individual elements accessible and can the audio path be re-patched? If accessible, then it's a really cost-effective way of adding an additional oscillator, envelope, LFO & Delay to an existing rack. Obviously I cannot tell for sure yet, but I did have the original Erebus as mentioned, and that was a semi-modular in the sense that it did come pre-patched but offered some (not ALL!) possible patch points, allowing you to break some (but again, not ALL) pre-normalled connections. obviously, it might be the case that this too will have the most common connections normalized and the offered patchpoints DO NOT break those normalizations, but only ADDITIONAL outputs/inputs. the Dreadbox website is not terribly clear on that, it only states that the module offers 16 patchpoints... might have to write them an e-mail to ask. either way, you are completely right in that this (especially if you DIY it yourself) will be hard to beat in terms of bang for bucks... I paid 173 incl. shipping for 2 VCOs, ENV, LFO, Filter, VCA _and_ a delay. I've ordered a kit anyway - as you say €173 (shipped) for all those various elements is great value, even if the audio is normalised. Oh, and you forgot MIDI to CV! Could you patch external audio into the delay? Looks like the Audio In is under the envelope section. On the Erebus desktop the exteral audio input was through the VCF, so I imagine it's routed similarly here. Please note that you will need to activate the gate for the sound to be passed through. so basically exactly like the "big Erebus". only caveat would be that the VCA needs a gate to open or no sound will pass. Has anyone else noticed and been confused by the fact it doesn't have a release stage on the envelope? It seems like an odd choice, but then maybe the idea is to use the delay to have notes fade out. It'll be interesting to see what people make of that. Me too. And I've always been tempted by the Erebus. 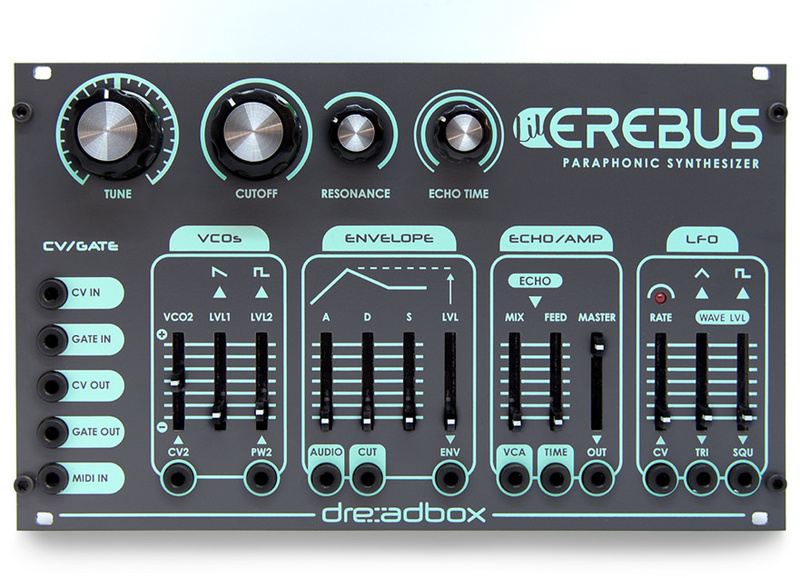 I thought that the Hades was just a brief and failed foray into kits for Dreadbox, but it seems not. Hopefully we'll see more of the same from them. I'm tempted to get this as I'm starting out with eurorack and it's (as others have pointed out) great value considering you're getting VCO(s), Env, Delay, LFO and filter. What I would like to know more about (and I guess it'll become a bit more clear when reviews start appearing) is what are the obvious downsides? Given I'm happy with the DIY aspect, this almost seems too good to be true in terms of functionality per £/$? - finally, the amount of spaces this takes up - 42HP seems like a lot to me. and a gate switch for external audio. If i was you id just buy a kit, even if your not up for building it yet just put it way until you are ready to build it, if you decide not to build it in the future I'm sure somebody will buy it off you for the price you payed or even more if the kits stop. I doubt you'll get a metal screen printed panel of this size for 4£ anywhere. Same goes for the PCBs. Have you ever ordered a PCB of his size? It's going to substantially more expensive than that, even for super cheap and bad quality Chinese PCBs. Also, add up the cost for the parts. The sliders alone almost fill up your 25£ estimate. It's not clear how much of the signal path is analog (& can therefore be tapped into) - I suspect the majority of the functions, including the VCOs are simply running in code in the Atmega8a with some external sensing / control circuitry - similar to the Mutable Instruments way of doing things but probably without the open-sourced code. certainly not. At least the original erebus is fully analogue and also here I very strongly doubt that the VCOs (or anything) runs on an ATmega. I assume the chip is mostly for the midi stuff (the kit has a midi input). But I don't know, of course. I very strongly doubt that the VCOs (or anything) runs on an ATmega. I assume the chip is mostly for the midi stuff (the kit has a midi input). But I don't know, of course. That would be great news. Let's hope so. Anyone can point me to the resistor that is for the LED brightness? My Hades is really too bright and this time I want to put a bigger resistor in there for the LED.